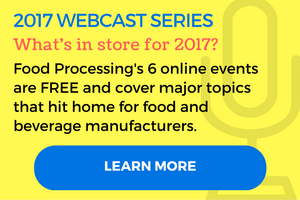 New and emerging technologies can take years to find a food manufacturing audience. This year’s IFT Food Expo included several innovative drying and kill-step technologies at various stages of the development cycle. More than 200 industrial-scale high-pressure pasteurization (HPP) machines are in service in North America, most owned by food companies that primarily use them for their own products. A growing number are owned by tollers who accept packaged food and beverage products in fee-for-service arrangements. Heat kills, and that’s fine with food processors who want to ensure the safety of raw and minimally processed foods. Heat also degrades the quality of products, and that’s a concern when the product in question’s health benefits are compromised by thermal treatment. Vacuum, ultraviolet light and other techniques can limit negative impacts, but processors who want a food safety intervention that doesn’t degrade taste or nutritional value have had to rely on propylene oxide and other chemical pasteurizers, all of which leave behind some residues, however minute. Strictly speaking, a new intervention from Agri-Neo Inc. (agri-neo.com) is a chemical, although it has been certified organic by Ecocert Group, L’Isle-Jourdain, France. The only residue is water, developers point out, and log reductions from 2 to 5 or more for bacteria, fungi, yeast, mold and coliform loads are delivered, depending on the dosage used. Agri-Neo is a Toronto-based startup that began research on the technology in 2009. Beta testing was done last year with several Canadian food processors. Everspring Farms, a Seaforth, Ontario, firm that processes about 25 varieties of raw seeds, sprouted grains and other natural products, commissioned an industrial scale unit in May. Everspring Farms is taking a measured approach, applying the compound to seeds like chia and flax that will be sold as ready-to-eat and offering it as an option to customers who will further process them, according to owner Dale Donaldson. “So far, I’m happy with the system,” he says, but the processor is evaluating the results on a case-by-case basis before expanding treatment to all products. Everspring previously deployed an infrared pasteurization process, but results were inconsistent. According to Rob Wong, Agri-Neo’s president and COO, the system consists of a rotating drum in which a mist is sprayed on up to 12 tons of product per hour. About 2 percent moisture pick-up occurs during the process. A post-treatment dryer is an optional though highly recommended component. The biocide is classified as peracetic acid, although it is derived from several types of plants, with food-grade ethanol as the carrier. The solvent contributes a molecule of oxygen when it contacts a microbe, rupturing the cell wall and leaving behind water. “The combination of agents wasn’t something that was obvious, and they attack microbes in a number of different ways to consistently deliver at least a 5 log reduction,” he adds. Agri-Neo is working with two millers considering treatment of grain before it is milled. Those firms’ processes involve tempering to reduce moisture levels. The pasteurizer could be added during a hold step, avoiding the need for any additional capital equipment. Mass heat transfer aided by acoustic waves is an option for drying and cooling food that is slowly attracting interest and installations. The Dept. of Defense is one of the technology’s biggest proponents, with food scientists at the U.S. Army Natick Soldier RD&E Center in Natick, Mass., eyeing it as a way to improve the quality of shelf-stable Meals Ready to Eat (MRE). Tom Yang, senior food technologist at Natick, spoke about the technology at IFT. He cited numerous production efficiencies and food quality improvements to acoustic drying and cooling, including faster line speeds, significant reductions in energy use and a much smaller footprint compared to conventional dryers. Yang is working with Zinovy "Gene" Plavnik of Heat Technologies Inc. (HTI), an Atlanta engineering firm that secured a U.S. patent last year for acoustics-aided heat transfer. The physics of acoustic or ultrasonic drying involves the breakdown of the boundary layer that envelopes the area to be cooled or, conversely, cooked. As Plavnik explains, sound waves from ultrasonic transducers “start obstructing the boundary layer and allow heat and moisture to escape.” That accelerates the heat transfer process that occurs. Based on Natick lab experiments, heat and mass transfer rates are two to four times faster compared to convective heating and cooling. Energy consumption is 50-75 percent less, and the square footage for the machinery is one-fourth the size of a comparable cooler or dryer, according to Wang. Shelf-stable meat and fruit have been processed. Enough water in kiwi, pineapple and strawberries can be removed in 90 minutes to render them shelf stable, about eight times faster than conventional drying. HTI’s first industrial unit was commissioned in 2009 and has been used by converters, metal coaters and other industrial sectors. A year ago, a food company that was using the technology in its converting operations asked if it could be modified for a cooling tunnel in its baking plant. Sales for a new bakery item were soaring, and the existing 210-ft. tunnel that cooled product before packaging was a bottleneck. Instead of lengthening the tunnel another 200 ft., an acoustic module measuring 12 ft. was inserted in the line. The technology comes at a higher capital cost, though return on investment usually occurs in 12-15 months, depending on the application, energy costs and other factors, says Glenn Emory, HTI’s COO. In some applications, ROI was achieved in four months, he adds. Micro-assisted thermal sterilization (MATS) is another technology that offers faster cooling, though it is more of a function of fewer therms going into the food in the first place. In a comparison with retort, chicken breasts reached a set-point temperature of 130° C/266° F and were cooled to 80° C/176° F in 12 minutes, compared to 40 minutes in a retort. MATS was developed at Washington State University and licensed for commercial development in 2012, first to Food Chain Safety and then to 915 Labs LLC (www.915labs.com), Denver. The firm stages five-day “boot camps” to familiarize food professionals with the technology and to give them hands-on exposure. The most recent camp was in early August at the Washington State campus. Although 915 Labs didn’t exhibit, the firm’s representatives were on hand at IFT. Pilot-scale machines that produce 100 units per hour in batch mode are operating at multiple copackers, including MRE processors AmeriQual and Wornick, but the production cost makes those units impractical for commercial products. The first production-scale MATS machine will be shipped to a major food company in Asia late this year. A similarly sized line, which is rated at 15-30 units per minute, has been ordered by an Australian processor. Electricity is the power source for MATS, which competes directly with retort but is a continuous process and circumvents the need to store and ship metal cans. Test recipes call for half as much sodium and no preservatives. Semi-continuous drying and evaporation is provided by microwaves in a vacuum in Enwave’s 100 kW machine, which is 10 times larger than the earliest models. Photo: Enwave Corp.
“CPGs and process authorities view MATS as another thermal process, so they have a high confidence level in it,” says Mike Locatis, 915’s chairman. “The economics of production are cheaper than retort in terms of engineering, electricity and packaging, and it results in a product that is near-fresh.” Venture capitalists have poured $25 million into 915 Labs. Like most startups, EnWave Corp. (enwave.net), Vancouver, British Columbia, struggled for a few years trying to explain its vacuum-plus-microwave drying concept, but the firm turned the corner last year with its first profitable year. Also referred to as radiant energy vacuum, the technology is closer to freeze drying than spray drying, dehydrating food more quickly and at a lower temperature and cost than freeze drying. To help sustain the firm in the early years and gain commercial traction, principals and investors in EnWave launched NutraDried LCP in Blaine, Wash., three years ago. NutraDried licensed the technology to produce Moon Cheese, a shelf-stable snack. Grocers in 11 states stock the crunchy snack, but Starbucks is the big seller, despite price points higher than the norm. The technology has attracted pharmaceutical firms because the gentle handling, speed, efficiency and small footprint make it an attractive alternative to freeze drying. But most of the 18 licensees are food processors, including Gay Lea, a Canadian dairy co-operative that recently won a World Dairy Innovation Award for Nothing But Cheese, its version of Moon Cheese. Commercial success would have come earlier if EnWave had targeted entrepreneurs and mid-sized food companies from the beginning, believes Tim Durance, president/CEO and founder of the company. The largest packaged goods manufacturers require very long timelines before they will adopt new technology, and initial machine capacities and sales potential of novel products are too low to get them to invest. Smaller firms, on the other hand, are more entrepreneurial and willing to take a calculated risk.